Mountain Dew and Burton Snowboards teamed up to create a line of sustainable clothing made from recycled plastic bottles. The clothing line is called the Green Mountain Project Outerwear Collection. 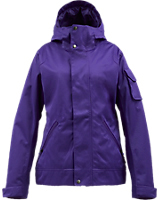 The eco-friendly jackets and pants use thread spun from plastic bottles that are blended with other natural products. Burton says the fabric performs well on snow and has a low impact on the environment. Burton and Mountain Dew said they will continue their partnership through the summer of 2013, when eco-fabrics will make their appearance in Burton apparel designed for year-round use.